A year after the terrorist attacks that hit Paris in November 2015, American artist Jeff Koons announced he would be donating a monumental sculpture to the city in honour of the victims. 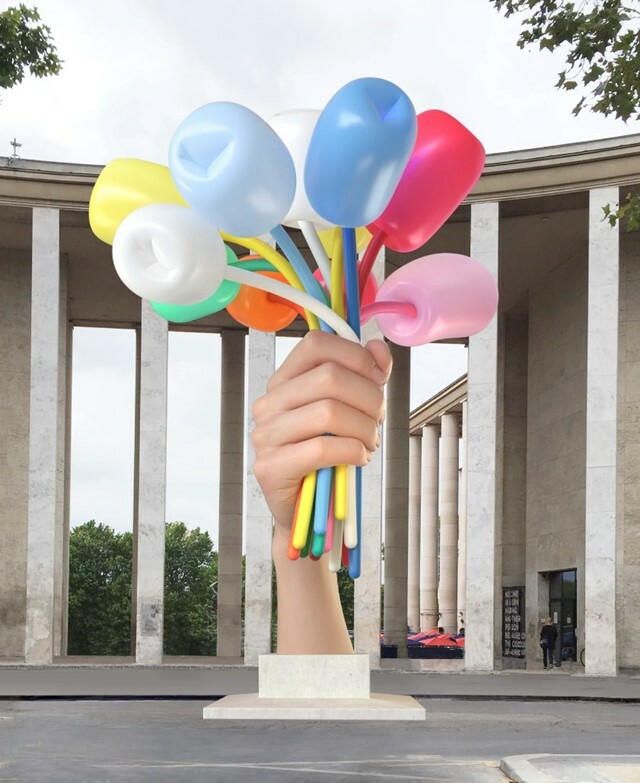 Made of 33 tonnes of metal and standing 12 metres high, “Bouquet of Tulips” represents a bunch of inflatable flowers held by a massive fist – a nod to the Statue of Liberty, Koons said, which France offered to the US in 1886. The tulips are expected to sit nearby the small lady liberty that inspired the New York attraction, just outside the Palais de Tokyo and the Museum of Modern Art, two of the city’s most important art institutions. However, the project has faced several delays since its announcement over two years ago. Notably, funding was hard to find – the artist offered the idea, but not to pay for its construction and installation. Meanwhile, critics in the art world and beyond have largely baulked at the massive structure. In recent days, 25 artists, gallery owners, and officials penned an open letter to stop the work going ahead. Published last Monday by Libération, the signatories – which include filmmaker Olivier Assayas and former culture minister Frédéric Mitterrand – denounce an “opportunistic and cynical” “product placement”, an act that is closer to self-promotion than commemoration. In fact, the site for the artwork is nowhere near the stadium, the Bataclan concert hall and its surrounding restaurants where terrorists killed 130 people and wounded hundreds. The letter also underlines the irony of exhibiting a huge name like Koons besides the Palais de Tokyo, a space precisely dedicated to young emerging artists. For Jeff Koons, 63, the tulips are a symbol of optimism, “universal values that the US and France share”, he told Le Figaro back in 2016. But the idea of an artwork celebrating mutual love between Paris and Washington seems hard to sell at a time when President Trump’s every move has sunk America's reputation to its lowest. Responding to the controversy, Europe1 reports, Koons’s agent said it was a matter of “the old world against the new world”. But whether he is right or whether this is just another case of typical French pessimism is a different topic. As to what the everyday Parisian thinks of all this? A radio commentator showed a photo of the tulips to locals on the streets. “What are they? Giant lollipops? Sperm?” one man wondered. “Barley sugar, surely”, said another. It seems the jury is still out.